BARACK Obama’s inauguration looms and they’re expecting record numbers for the Hajj. Saudi Arabia is preparing for a record turnout at the annual Hajj pilgrimage. More than 100,000 security guards have been deployed to cope with the three million people expected in the city of Mecca, when the Islamic pilgrimage gets under way on Saturday. The non-believers will lap this up. Sami Zeidan, Al Jazeera’s correspondent in Mecca, said that people were making last minute attempts to get into the city before the ceremony begins. He said that the authorities have attempted to uphold their declaration of “no permit, no Hajj” to control the number of people in Mecca and prevent overcrowding. There is also the possibility of attacks and stampedes as the pilgrims move among holy sites in the city for five days. Last year had no stampedes (see Hajj comes to a close without stampedes). But there was a big one in 2006, when 346 died. And that doesn’t count the 76 who died when the Al Ghaza Hotel collapsed. The biggest stampede on record was in 1990, when 1,426 died. 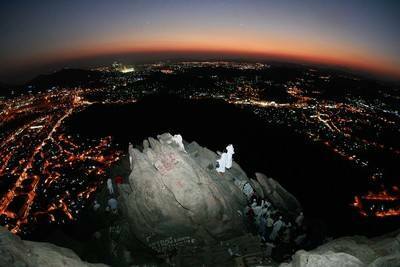 Image: Muslim pilgrims visit al-Noor mountain overlooking Mecca. According to tradition, the Prophet Mohammed received his first divine message while he was praying in the nearby Hiraa cave.